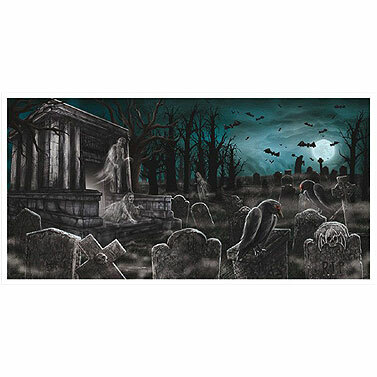 This Cemetery Plastic Banner decoration will add a creepy cemetery scene to a wall for Halloween. Detailed horizontal image is printed on plastic making it okay for outdoor displays. Hang with tape or similar adhesive. Cemetery Plastic Banner measures 65"L x 33.5"H.